Toaster (aka Todd Elliott) tells a story in both song title and sound on his new release, Theophany. In my previous outings with Elliott’s music I often found myself looking for a point of entry, something to hang on to when things went a little far afield for my tastes. I had no such issues with Theophany. Maybe this represents a slightly more restrained artist in that regard, or one who can set himself a fresh thematic course when needed, but it certainly doesn’t mean he’s lost any edge. Theophany moves in a distinct narrative direction, coursing from straightforward, beat-based electronic music into hypnotic ambient spaces and ending in darker, abstract zones, and all of it’s handled well. The disc opens with birdsong and the lazy beat of “From the Coast We Traveled East.” Sequencers gurgle over long chords and pads. It’s a nice, laid-back and accessible piece–and then things begin to change. “Eventually, We Reached the Desert” and “We Set Up Camp, and Got Drunk” are more angular and leaning toward disjuncture. “Eventually…” is pushed along with a thudding beat and a melody played out two plunking notes at a time. “We Set Up Camp…” elbows its way in with a recorded conversation thrown over hissing drones and a shuffling beat that turns into an almost-urgent and strident rhythm. After this is where the shift toward ambient and deeper spaces begins. “When We Woke Up We Realized We Were Lost” tosses out the beats and turns the landscape into a mist-shrouded, half-lighted place. “Night Fell. We Saw A Light and Walked Toward It” starts out hushed, but evolves into big-waveform ambient, swells of sound layered with more vocal samples. It leads to the center of the release, the 29-minute title track. This alone is worth the price of admission. It’s a vast, droning track, recorded live, heavy on the low end and accentuated throughout with (more) muffled vocal bits and other wayward sounds. Thematically, if this is the point where we experience theophany–the physical manifestation of God–then this is the slightly disjointed, mind-altering space we’re taken into, experiencing something with which we’re not familiar, and looking back through the manifestation to get our bearings. Elliott takes us through it with these gentle sounds and breath-slowing simplicity, but heightens our awareness with the additional elements. Late in the track he folds in harsher sounds, forcibly pushing us out of reverie. A great track. It also serves to take us into the disc’s biggest gamble, “We Made It Back to the Coast.” Minimal drones rise to a buzzing level, then give way to a long stretch of little more than wind, rumbles of thunder, birdsong and field recordings. (And a couple of jarring slams.) This is where Elliott runs the genuine risk of losing the listener. We’re talking about almost 10 minutes of a 14-minute piece given over to what might literally be a sound recorder sitting on a window sill. Listen at the very end–someone comes over and picks it up. I find this part fascinating for its simplicity, the layering of sound–I can’t tell if the wind or a bass drone is grumbling at the low edge of hearing–and also for its sheer ballsiness. I do think, however, that a fair share of listeners may be put off by it. The disc closes with the deep drones of “We Mourned the Dead, and Drew Comfort from God,” another live recording, to end the story. I like the way that Theophany starts with very open doors, very accessible and, for lack of a better word, easy, and then gets more challenging as its story progresses. Elliott’s not afraid to leave people behind in pursuit of what he’s got to say. The depth of sound here is excellent, and it’s a very affecting release. 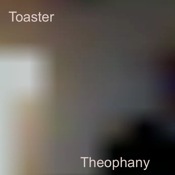 I’m coming to appreciate Toaster more with each new exposure.